Sanford is more than a city rich in Florida history. It is a city where everyone feels like they belong and the spirit of Southern hospitality is experienced on every street corner. Take the time to stroll the residential streets that are lined with beautiful city parks and hundreds of turn of the century homes, adorned with hundred year old oaks that whisper the secrets of the past. Experience the rich history and the revitalized businesses that provide a number of special things to do in Historic Sanford. At one moment you will be immersed in the history of the steamboat days and in the next moment transported to a vibrant small town filled with antique shops, a flourishing arts district and unique restaurants. Spend an afternoon in this downtown setting with brick streets, restored buildings and sidewalk cafes. Browse for that one of a kind treasure or enjoy the arts and create a memory that will travel with you. We invite you to our wonderful city to savor our history and pride in our past. Make Sanford your next destination in Central Florida! This little town always has something going on! Events like "Sanford Alive After 5" to additional events in the Historic District. 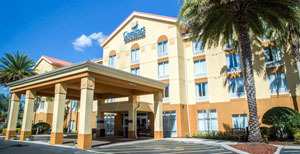 Comfort Inn & Suites in Sanford FL .